First of all, Operation Suit Squeeze will be shortened to OSS from now on. I don’t want to write it out every time. Additionally, this is a long post. Sorry. Just some necessary background info in this one. Day one was okay. Woke up, then played a little fetch and chase at the dog park with the labradile. Fetch and chase is our primitive version of fetch where Olive will go get the object, come back halfway, and then make me chase her. It’s a nice little mini-workout, but I look forward to just being able to throw a ball. After the dog park, the girlfriend and I went for a run(!). I hate running. I’ve been avoiding it all summer. But I can’t go to the student facilities anymore (stupid graduation) and I don’t have money for a gym membership. So I’m kind of out of options. My hatred of running stems straight from my genetics. Baldaufs do not run. It’s a fact of life. This is a representation of a Baldauf running. Notice the flailing. I couldn't actually find a picture of any of us running, hence the representation. Also, it's my brother! The skinny one. When I ran track in high school, this was brought up at many family outings. 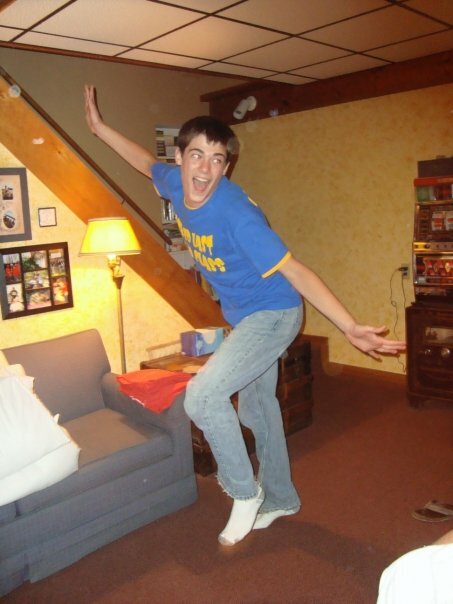 Turns out, I didn’t really run track so much either. One time, I lost a 100m dash by 15 meters. Another time, I ran 300m hurdles (my coach really didn’t know what to do with me) and I ended up doing the last 10 meters like a gorilla. Unintentionally of course. (For the record, I did make it to state for the 4×400 relay. As an alternate. I usually leave that part out). But us Baldaufs generally run like we’re hauling something behind us. Lot of motion, very little distance covered. Except my dad, whose sprint is really just an accelerated trot. Additionally, I am allergic to running. Seriously. For reals. (It’s a serious problem, okay!?!) Every track season, I got sick. Any time I run, I phlegm up. For those of you with a weak stomach or about to eat, you might want to skip ahead a bit. I run, and my entire throat becomes clogged. I can’t breathe. I spend my entire run making that god-awful phlegm clearing noise (those of you who know phlegmy people know what I’m talking about). Needless to say, this really screws with my breathing. Anyways, we ran almost 2 miles and walked the last mile. Not a great start, but it’s a work in progress. I was feeling pretty tight. Got home, ate a fried egg, ham, and cheese sandwich. And that was it for brunch. Ate a handful of walnuts and banana chips later in the day for a snack. Dinner is where I ran into trouble, though. The girlfriend’s sister (and Shane vs Genetics follower Keighley–shoutout) was in town and there wasn’t time to cook dinner, so we went out. We ate at State Street Brats, where I work, and I ate WAY too much. Classic example of overeating. I’ll chalk it up as an exception due to the lack of time to cook dinner, but I do need to work on my eating habits when I eat out. I did hold out against ice cream, minus a couple of small bites from the girlfriend’s. So the ban on sweets is safe. Day 2 sucked. A lot. I woke up, ate a yogurt, and went to work. Worst. Shift. Ever. People need to tip!!!! (Which is only a small fraction of the worst shift problems). I brought some trail mix stuff to snack on at work and some gum in an attempt to avoid grazing all day on the rogue fries or popcorn that has gotten the better of me all summer. Only managed to eat a mouthful of trail mix though, and then we were too busy to worry about eating. Had a couple of handfuls of popcorn at the end of the shift, but avoided the temptation of an arnold palmer or root beer. I’m a serious stress-eater or frustrated eater, caving in to unhealthy foods every time. Successfully avoided those today, which was no small feat. 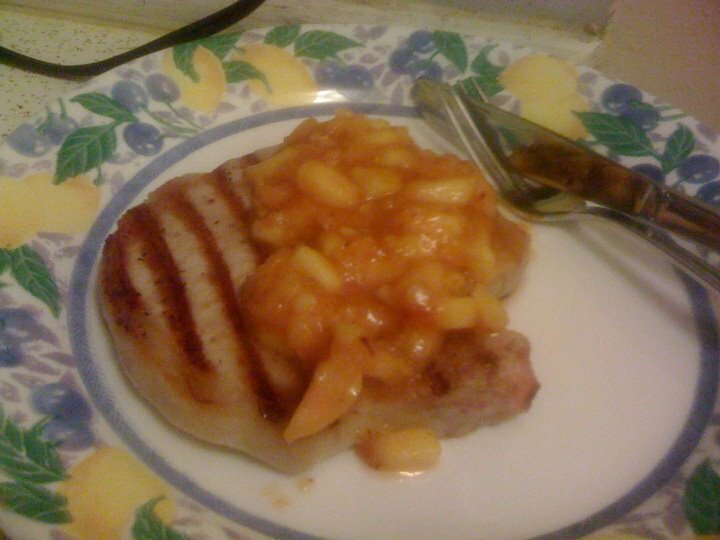 Dinner was pork chops with a grilled-peach/ginger chutneyand a piece of bread. Got it off eatingwell.com (good site). Tasty, but I should have made a veggie side to go with it. Pretty hungry now. (Can’t lose weight without being hungry, right?) Hanging in there, though. Running in the morning. Fighting the chocolate bar that’s staring at me across the room. Hopefully the sweets ban is still in place by tomorrow. I would definately have added some veggies to that meal. Maybe brocoli – or a salad.